A $5 million building project at Franklin Heating Station to increase the reliability and extend the life of the plant will begin early next year. Looming in the future, probably in the mid-1980s, is a decision on a new power plant if Mayo continues to grow. The improvements to Franklin Station, which is owned by and serves Mayo Clinic, Kahler Corporation and Rochester Methodist Hospital, will be completed early in 1982, according to Karl Ladner, chairman of the station’s executive committee and treasurer of Mayo Foundation. The main addition will be a diesel-driven electric generator to start the boilers and to supply power for elevators and emergency lighting systems in the event of a power outage. Other improvements will include a new tieline to the city’s Silver Lake plant (which supplies a portion of the three institutions’ electrical power), water treatment equipment for boiler water, water softening equipment and modern oil burning equipment and controls for two boilers. Greater usage of oil as a fuel is expected because of the decreasing availability and rising cost of natural gas. An office building adjacent to the southeast corner of the main building will be removed to make way for the expansion. The project will also raise the northwest portion of the building to the height of the main building. Franklin Station was built in 1928 in conjunction with the Plummer Building to provide heat, electricity and tempered water for the Mayo and Kahler buildings. Methodist was added in 1975 as a partner. It is a cogeneration plant, meaning it produces usable heat and electricity. Heat is a waste product in a conventional system. Steam for heat is the main product of the plant and electricity and cooling capacity are its major by-products. Since the plant was built, the partners’ use of electricity has grown to where it exceeds the capacity of the plant. More electricity is purchased each year from the city. The city also provides back-up electricity. The demand for cooling capacity is expected to be exceeded in the mid-1980s and for heat in the 1990s. (These dates are estimates.) 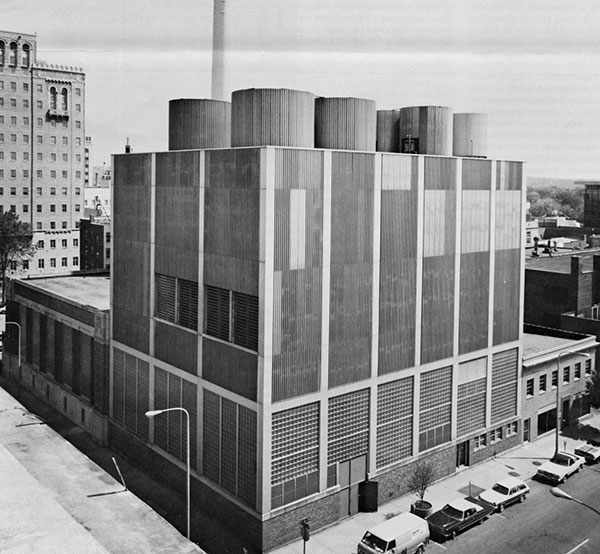 The question of further expansion of the plant depends on a number of hard-to-predict factors, among them: the price and availability of fuel, the growth of the downtown medical and Kahler buildings, the effectiveness of energy conservation measures, technological advances and environmental laws. All of these will be considerations in deciding if there will be a new plant, and if so, its size, fuel and location. Franklin Station was an energy conservation project decades ahead of its time. It was cited two years ago in a federal Department of Energy publication on new trends in energy generation and conservation. Its cogeneration system is twice as energy efficient as conventional methods. The traditional generating plant produces steam in boilers which drive turbines to generate electricity. The steam is then passed through heat exchangers and converted back to water for the boilers. The heat from the steam is dissipated through the heat exchangers. The process converts about 30-40 percent of its fuel (natural gas, fuel oil and coal) into usable energy. Franklin Station converts 78 percent of its fuel into other forms of energy. It heats water in the boilers to 850 pounds of steam per square inch to drive the turbines. The turbines drive generators which make electricity. When the energy from driving the generators is reduced to 400 pounds, it is used to run two small generators for internal purposes. It is also used to run three larger steam turbines which make the chilled water for the complex, as well as to run several house turbine pumps which circulate the water around the complex and up to the cooling towers. The 400 pounds of steam is also extracted to heat the buildings in the medical complex at a pressure of 10 pounds per square inch and to drive the refrigeration units. Products created by the process include heating, cooling, electricity, refrigeration, tempered water, soft tempered water, cold water, compressed air, moisture to humidify the buildings in winter and steam for instrument sterilization.